1 liter Mango/Perske vrugtesap konsentraat, 100% suiwer vrugtesap mengsel, maak aan met 5 liter water. Vervaardig deur Magaliesberg Sitrus. Bevat geen preserveermiddels, MSG of rietsuiker nie. Die SA Aandag Afleibaarheids Ondersteuningssentrum onderskryf hierdie produk. Kontak my gerus en vind uit van spesiale aanbiedinge op groot maat. Groot maat = 12 x 1L bottlels. 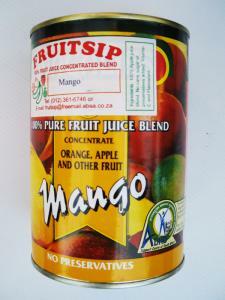 1 liter Mango/Peach fruit juice concentrate, 100% pure fruit juice blend, mix with 5 liter water. Manufactured by Magaliesberg Citrus. Contains no preservatives, MSG or cane sugar. The Attention Deficit Hyperactivity Disorder Support Centre of SA endorses this juice. Feel free to contact me for any enquries regarding special offers on bulk purchases. Bulk = 12 x 1L bottles. Mangoes belong to the genus Mangifera, consisting of numerous species of tropical fruiting trees in the flowering plant family Anacardiaceae. The Encyclop�dia Britannica (2008) reports that the mango is "considered indigenous to eastern Asia, Myanmar (Burma), and Assam state of India". Cultivated in many tropical regions and distributed widely in the world, mango is one of the most popularly exploited fruits for food, juice, flavor, fragrance and color.